My husband and I have main characters on the Earthen Ring realm. We really would like to find a socially active guild on that server (Alliance side) that's not neccessarily G or PG-rated everything. Do any of you have such a guild on the realm? It would be great to find a guild that gets together for raids, but we are not too serious about raiding. To us, raiding = making progress with some laughs. We are mostly found online 6 PM - 10 PM ET, through the week. Later on the weekends, of course. We both have DPS, tanks, healers. I would rather DPS & tank, he would rather DPS & heals.
. . . I really want to take Pleasure-Bot 8000 up on that massage. This morning after the reboot, there were no NPCs in the Eastern Kingdoms. None of us Alliance could get to Stormwind, and those who were there reported no NPCs or mailboxes. Someone said they could ride the boat from Darny and indeed it worked. Then I got an idea. I grabbed my Troll, flew to Darny and hopped the boat. No guards. I took the throne. My Troll wins the World of Warcraft. Patch 6.0.2 drops on Tuesday. Squish: Numbers are being squished from the millions needed now. New character models: no worries - if you don't like the new models you can opt to keep your old model! The Iron Horde Invasion: Phased Blasted Lands, quests to do, and newly revamped UBRS with Warlords gear drops! I created my first Horde 90, after 8 years of playing this game on and off - first Horde to level cap. I was planning on using my boost for Horde anyway. After months of consideration I realized I didn't want to play a dwarf or a Draenei so I went Troll shammy. To get the profession boost I leveled "Planck" (After Max Planck) to 60 first. My backstory (I have back-stories for all my main toons) so far is just that Planck, not being a fan of Garrosh, got "Sent to Alaska" Blasted Lands, Drealmaul Keep, where little happens. One day, on duty upon the battlements, he looked out and saw the Iron Horde appraoching. He turned to the guard next to him and said "Hey, mon - dose orcs don' look like our orcs..."
Looking forward to 6.0.2 so I can figure out more of his story in the invasion. celticdragonfly was dpsing in LFR, singing "I am I, Don Quixote, The lord of La Mancha" then suddenly burst out "Why do I have the aggro?" "The aggro is your destiny," I said. Hi! Is this community even alive anymore? I'm having some weird latency issues, wondering if anyone can shed some light. I've recently gotten a new computer: custom built for WoW as my old one had its issues with the game. Everything's been going well, except the past few days the latency on it has gone through the roof. It averages anywhere between 2-4k ms, but today it hit as high as 13k ms. Really not fun playing that slow. Plus, I occasionally see messages of being disconnected from battle.net and connected back to it. I asked guildmates: nobody has the issue. I hop on my old machine sitting right next to it, and the latency is just a few dozen ms: unnoticeable, except for whatever issues it has with the game aside from it. No disconnects whatsoever, just low framerate, but this is one of the issues I've had on it. What might it be? I'd think it's the machine, but it was rolling smooth before, plus this battle.net dc is making me question if it is the machine after all. Then again, the old machine doesn't have the problem, nor do I get dc'd from battle.net there. We tested the network connection, and both machines check out fine. *Echoing footsteps* ...Man, this place is quieter than Feralas. Also the main page's artwork is broken. Maybe a mod could take us back to a simpler format. It's maintenance day, not that it matters anymore here. It's Caturday! Patch 6.0.2 drops sometime in October. It's on the public test realm now. We're getting new character models. Warlords of Draenor, taking us to an alternate universe Outland where the orcs didn't drink the blood (see the cinematic), drops on November 13. WoW's 10th anniversary will be celebrated in November with an up-to-date Molten Core raid and a new battleground - the Battle for Southshore. 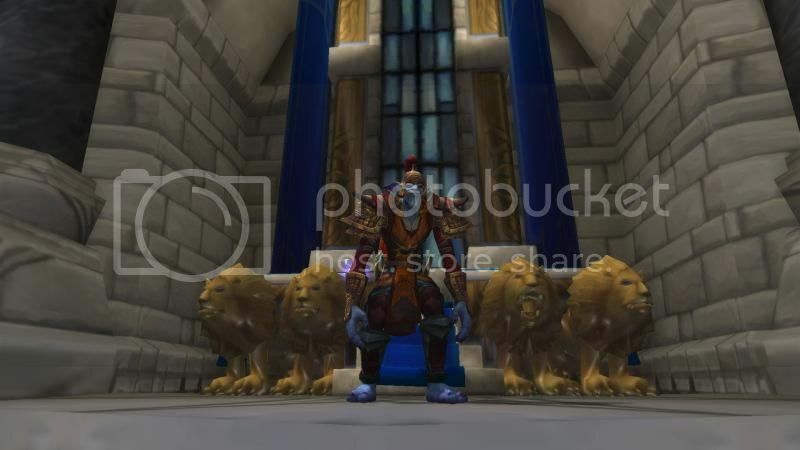 If you have not played a character since November 13, 2008, their character's names are going to be released as of the dropping of patch 6.0.2. If you want to keep the name, log in with the character. SO.... if you haven't played for a while and are thinking about getting back in eventually. Log in to save your names. If you want to use some claimed names, get back in here! The above probably also counts for active accounts but who still have chacters on other servers who haven't been logged into. Dust off those old toons or lose the names, folks. Me? Well, I stll play on and off. My 10-year-old son has a boosted 90 he's loving playing on. I just returned, got What a Long Strange Trip It's Been (FINALLY) and am looking forward to the expansion. Is WoW dying? Probably. Nothing lasts forever. But it's still been fun to revisit now and then. 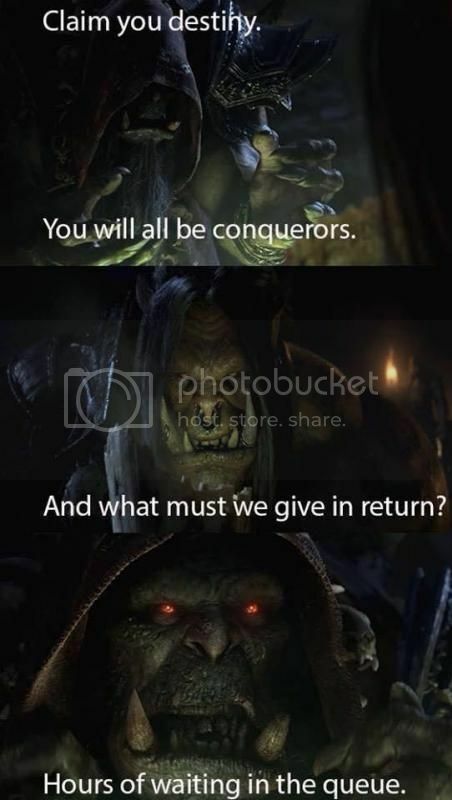 Yep, I know this community 'taint what it once was, but if any of you are still watching it the Warlords of Draenor expansion pack became available for preorder (one 90 boost included! ), AND you can buy a 90 boost ny itself for $60. I didn't see anything in the rules against this, but if it's not allowed feel free to delete this post. I'm trying to sell off a King Mukla card on ebay. It's the loot card that gives the Bananas pet in the game. The price is pretty low at the moment, but the auction doesn't end for another 5 days. I'm leveling my first toon from level 1 since.... Burning Crusade. I have three mains, two started during Vanilla and one started during BC. My play has been sporadic for several years, and when I have played I've been busy at Level Cap. I made Proxima the Human Hunter when Cataclysm dropped, he stopped at 35 and had been sitting in Duskwood. I slapped some Heirlooms on him, discovered the Darkmoon Fair buff and set about levelling. the old world I wasn't surprised about, but entering Outland at 60... wow. Trollbanes Command + Darkmoon Fair + heirlooms = i was level 65 before leaving Hellfire Penninsula. Only quests, no dungeon finder. I think it took me a month or two to hit 70 in Outland when BC released. Account Hackers Get Jail Time(!) in China. A page just about us on Wowpedia. Did you know this community turned 10 years old on September 9? You folks - or as I've called you over the years "My Livejournal Guild" - have been with me since my first post to this community on March 7, 2006 and I'm in y'all's debt. I'm a history buff. Whenever I get into something I try to find out where it has been, etc. That's why - frustrated no one else had done so - a few years back I started the Timeline of Events Surrounding World of Warcraft for the Fans on Wowpedia. This helps folks out with things like "When was World of Warcraft mentioned in an episode of Stargate Atlantis?" or "When was that World of Warcraft Mountain Dew Promotion?" And yesterday I started a page on Wowpedia for this community. I'd been thinking about it for a while, and finally broke down. If this community fades away (nothing lasts forever, alas), we'll always be remembered as a part of the game. I'd like your help! If you're a wiki junkie like myself you can feel free to edit the page. If you have some history of the community please share it here (Please, no digging up old drama - that goes unsaid in any community). And again, thanks to all of you - new members and old. I am back, o learned ones, with yet another question. Your kind indulgence would be gratefully appreciated. I am curious about guilds. In fact, I have been for a while, but now that my hunter has reached a level in the sixties, I think it’s feasible for him to be at leisure to join one and see what the heck it’s all about. I’ve been too busy questing and levelling up to spend time learning about them. I actually did join one, early on, but its members ignored me (so why ask me to join?) and my chat pane was full of their smug, cliquey and sometimes profane chatter. Also, I think that there were probably too many members for comfort. A dozen or so would probably have been nearer the mark. I could see no in-game benefit to being a member, and received so many other invitations, before and after, that I formed the impression that some guilds were intent on recruiting as many heads as poss for its own sake, rather than seeking you because you have something specific to offer. I quit the guild and blocked guild invitations. I’ve been a lone wolf player for all this time, and am thinking that I’d like to interact with sensible, helpful coves out there. I’ve poked about in the Guild Finder, but it doesn’t tell me much. I gather that guilds are formed for different reasons, but I’m a bit hazy on what those reasons are, and how to ascertain what I’d want from a guild, or have to offer. Presumably, my different characters have differing talents to offer? 1. Can one player have several characters in one guild? 2. Can one player have each character in a different guild? 3. How can a player seek out guilds that offer specific benefits or goals? 4. Does a player put out an ad of some sort (“mage seeks huge guild for chatter and mutual lunchtime back-rubs”?) listing his preferences? I imagine that the responses would be overwhelming. I think I’d want a guild whose members help one another out during gameplay (if someone is on a quest needing several players, I’d be glad to pitch in, and I’m now coming across quests that require more than one player – and some people out there are unfriendly or have buzzed off by the time I type in a greeting and the suggestion to tackle this monster together). I wouldn’t mind sharing loot and even gold. What I would not be interested in is a purely social experience, what I had for lunch, isn’t So-And-So an idiot, etc. Lordy, I can do that in the workplace. And before you ask, the realm I play in is Ysera. Thank you for your attention, mes braves. For any of you who don't know, evidently the NSA has been spying on World of Warcraft. Somewhere out there, someone is being paid to both be a real spy AND play World of Warcraft all day. God, did I pick the wrong job. Know what I keep thinking? The NSA is trying to protect us against an attack - is that against the Alliance or the Horde? It reminds me of the people who join a raid against an opposite-faction capital city and one of them ALWAYS says "I need to log off for just a second, hold a spot for me!" so they can go blab to the other faction.